Bates's Weaver was formally described by Richard Bowdler Sharpe, an English zoologist and ornithologist who worked as curator of the bird collection at the British Museum of natural history. Bates's Weaver was collected by George Latimer Bates, an American naturalist. Bates visited West Africa in 1895, making a living by farming. In 1905 he settled on the Ja River, Cameroon, calling his farm Bitye (after the Bulu pronunciation of his name). He collected many natural history specimens, especially birds, in his travels and sent many of these to the Natural History Museum in London. 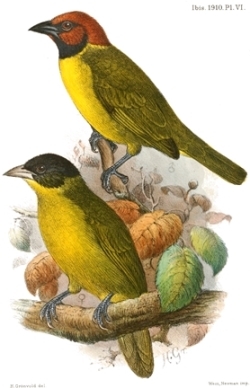 Bates obtained the type specimen of Bates's Weaver, a female in subadult plumage near the Dja River on 29 January 1906, presumably near Bitye farm (as stated by Bannerman 1949a). On 17 Nov 1908 a second specimen, the first adult male, was collected at nearby Kumangola. In the following year four more birds were collected at Bitye and sent to the British Museum. Bates did not observe these rare weavers alive; they were all collected by local boys with bows and arrows (Bates 1930a). Bates obtained the first Bates's Weaver specimen in January 1906, nearly a month before obtaining the Red-crowned Malimbe type, but Sharpe described the latter first. 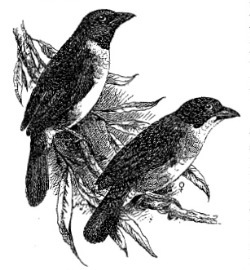 Bates's Weaver was first illustrated by Ogilvie-Grant (1910), showing the female type and first male specimen. The next illustration to be published was a line drawing in Bannerman (1949), showing the male and female. Othyphantes batesi	Sharpe 1908a,	Ibis p.348,	Dja River, Cameroon. batesi, Named after George Latimer Bates (1863-1940), a naturalist in tropical West Africa, 1895-1931. The type is in the Brisitsh Museum (BM 1908.5.25.104). Identification. 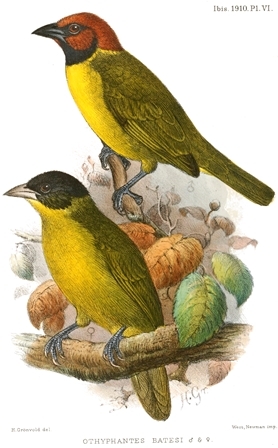 The Bates's Weaver male is green above and yellow below, with a unique head pattern that consists of a rich chestnut crown and face with a black throat. The female has a black crown and face, and yellow throat. The juvenile resembles the female, but the head is pale olive-green, not black, and the bill is horn-brown instead of black. Distribution. 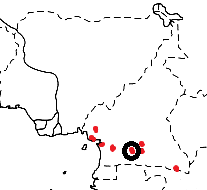 The Bates's Weaver is restricted to a few localities in southern Cameroon's lowland rainforest (see map below, based on Birds of Africa). There are no subspecies of the Bates's Weaver. It is listed as ENDANGERED, due to its rarity. The estimated global population is less than 1000 individuals, and it is probably declining due to habitat loss. 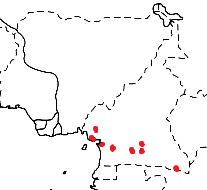 It has been recorded only at nine sites in a narrow belt from Limbe east to Moloundou. In recent years, it has been seen on Mt Kupe (twice in 1990) but not since, in spite of intensive searches. It has been seen near the Dja reserve (at Somalomo in 1995 and at Shwani, 12 km from Somalomo, in 1996). The rarity of Bates's Weaver is a mystery; it may be due to the loss of some specific habitat feature but the species was already rare when it was discovered in 1906. Habitat. The Bates's Weaver inhabits lowland rainforest, up to 900 m on Mt Kupe. Food. The Bates's Weaver feeds on insects. It forages singly, or in pairs, and once was seen in a mixed-species flock of insectivorous birds. It moves in a zig-zag manner up creeper-covered tree-trunks. Breeding. There is no information on the breeding biology of the Bates's Weaver and the nest and eggs are undescribed.